Maximize productivity with the Primera RX500 RFID label and tag printer, the only fully integrated desktop RFID (full color) label and tag printer. It is a compact size and weight, so it has a small foot print and is easy to carry. It’s excellent for businesses with projects that need RFID and color features without taking up too much space. Not only is this printer’s UHF reader and encoder by Honeywell®, it also supports EPC Global Class 1 Gen 2, ISO 18000 -6B and 6C. 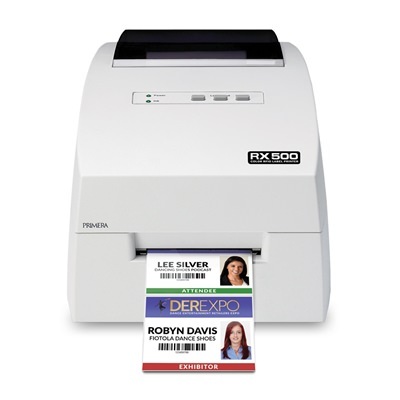 This inkjet label and tag printer is an excellent addition to any business looking for integrated technology and features. It is compatible with Windows 7/8x/10+ and Mac OS x 10.9+ and is easily integrated with most software. The printer is very light weight and won’t overtake available desk space. It is great for short run color RFID printing and boasts 4800 dpi full color printing as well. The ultra high resolution inkjet printer produces tags and labels up to 2.5” (63.5mm) per second up to 4.25” (108mm) wide.